Hindustan Unilever is avoiding its responsibilities to its workers exposed to mercury in the thermometer factory it owned in Kodaikanal. IT was when the men in moon suits arrived that it really sank in. There they were, with breathing apparatus and impermeable all-in-ones, gingerly taking away the material that had been sitting for five years in an open-air scrapyard in the middle of the busiest part of town. Vegetables and meat had been sold around it, children and devotees of the neighbouring mosque and church had walked daily just metres from what was being treated like a ticking bomb. It was glass from the factory at the top of the town’s forest-lined ridge, which produced nearly 10 million thermometers 1 a year for export to the West without a puff of black smoke in the sky. And it was being taken away using technical gadgets by a crack decontamination team for special disposal by experts in the United States of America. It was so dangerous that the soil beneath it was going too. The glass was edged with a poison – mercury. Mercury that looked so harmless and clean and silvery. 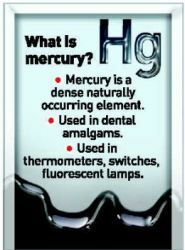 Mercury that doctors used in instruments in their clinics. Mercury that had laced the bodies of homebound factory workers. Was that why the trees were withering near the factory site? Was that why factory workers would get dizzy and ill often? Was that why 23 of them died, most in their early 30s? THE ENTRANCE TO the Hindustan Unilever thermometer factory in Kodaikanal, which was closed in 2001. 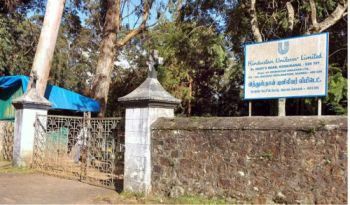 These questions and more were on the lips of townspeople in Kodaikanal, a hill station retreat set almost 2,200 metres high in the flourishing forests of the Western Ghats of Tamil Nadu. It was 2003, and that year mercury-contaminated waste weighing almost 300 tonnes was extracted from the town. It could not be ignored. At that moment, the public eye in Tamil Nadu and beyond was focussed on the thermometer factory. 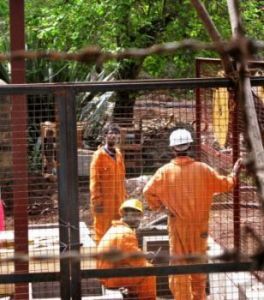 The news was reported 2 of how in 2001 the Palani Hills Conservation Council and Greenpeace had caught the management selling mercury-contaminated glass to a local scrap dealer and how, faced with the evidence, the Tamil Nadu Pollution Control Board had asked the 18-year-old operation to close. The moment passed with much left unquestioned and unanswered, and much more cleaning to be done. Nine years after the factory was closed, Frontline shows that the land lies polluted and the workers have grounds to fear mercury poisoning. Frontline unravels how a global corporation took advantage of lax laws in a developing country to run a second-hand plant full of ageing equipment that compromised on safety. We reveal how the company is denying its responsibilities to employees and the environment by relying on questionable scientific studies it commissioned or conducted itself and by withholding employees’ medical records. We detail who was involved, who was ignored, and the abject failure of regulatory authorities in the State to do anything to bring the company to heel. The company is Hindustan Unilever, the Indian subsidiary 52 per cent of which is owned by the Anglo-Dutch giant Unilever. Responding to Frontline, it admits to polluting the factory grounds but denies all other allegations. R. Vijaylakshmi 3 said it happened after three months of work at the mercury thermometer factory when she was just 21. The giddiness, the stomach pain, blood in her urine. But she needed the Rs.135. So even though her husband’s friend, a doctor, asked her not to go back to work, she went anyway. 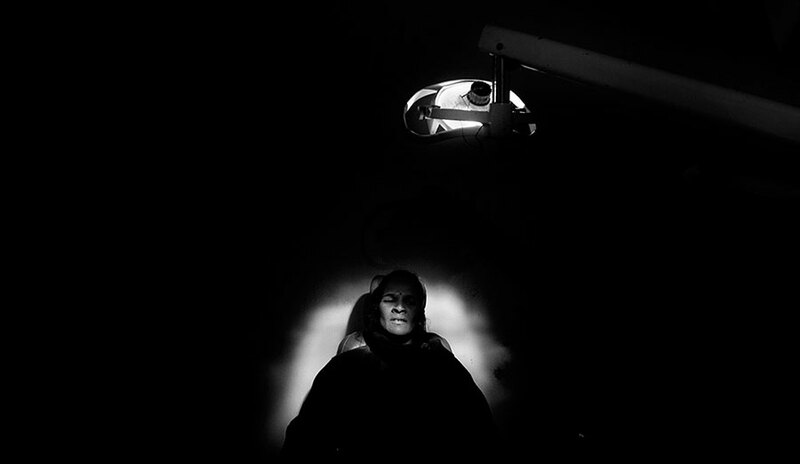 ON THE FACTORY premises, decontamination experts in “moon suits” and breathing masks remove mercury-bearing waste before sending it to the United States for special disposal, in 2003. “I was strong, like twice your body. Now I am like this. Sick, diseased, and consuming medicines all the time. I had a tumour in my uterus…. I am just 38 years of age. …I had a miscarriage just two months ago… I get periods twice every month…,” she said while fixing coffee in her tiny house just 200 metres from the factory. Vijaylakshmi worked for five years as a temporary worker. She is one of more than 550 men and women who claim that their work at Hindustan Unilever’s Kodaikanal factory caused irreparable damage to their health. 4 They say that since the factory opened, 23 of their colleagues have died young, 5 and that their causes of death reveal complications resulting from mercury exposure: lung problems, heart problems, and kidney failure. 6 Today most of the workers still in Kodaikanal report varying symptoms. These include headache, skin problems, eye problems, chest pain, dental problems, nose bleed, vomiting, blooded urine, breathing problems, impotency, irregular menstruation, miscarriage, giddiness, tremors, and inability to grip effectively. But the company dismissed these symptoms as having nothing to do with mercury exposure. It paid the workers a small severance package of three months plus a bonus, which is required by law when a factory closes under normal circumstances. 11 This was hardly normal closure. Hindustan Unilever denies that any of the health problems of the workers or their families was the result of mercury exposure in the factory. 13 Four years after the case was filed and nine years after the factory was closed, the workers are still fighting for compensation. The last court hearing was in June 2008. The levels of mercury to which workers were exposed are clear from the extent of pollution found on the thermometer factory site and beyond. Nestled in the forest greenery, the 85,000 square metre 15 plot on St. Mary’s Road looks innocuous. But over 28,000 kilos 16 of partially treated mercury sludge from the site was hauled out and sent back to the U.S. by the expert decontamination team in 2003. Today over 360 kilos of mercury remain spread over the site, Hindustan Unilever admits. 17 A 25 square metre area south of the factory had eight kilos of mercury in the soil. 18 These figures are high for mercury, where pollution levels are measured by the milligram. What townspeople and environmentalists fear is that the factory’s mercury will convert into an even more dangerous form, methylmercury. This happens when mercury is worked on by bacteria in the environment, and when taken up by plants or the fish in water, moves into the food chain. Methylmercury poisoning made news headlines in the mid-1950s after pollution from a mercury-chloride factory entered the sea in Minamata in Japan. Hundreds of people were poisoned by eating contaminated fish caught in the area. Some were paralysed, some went mad, some died. Only limited samples from outside the factory have been tested by Hindustan Unilever’s consultant. But the data it collected are enough cause for concern: samples from bark and moss, which pick up pollution in air, showed concentrations per kilo of up to 68 milligrams of mercury north of the factory and up to 80 milligrams to the south. 27 Dr Mark Chernaik, a scientist with the U.S.-based Environmental Law Alliance, whose opinions have been relied upon by the Supreme Courts of India and Pakistan and the European Court of Human Rights, reviewed the test results at the request of the workers. 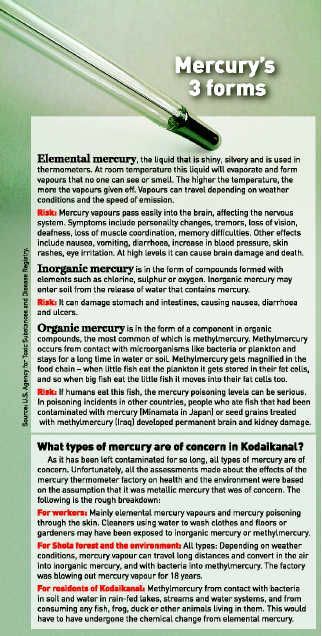 28 He noted that surface water samples taken from the Kodai lake and parts of the Pambar stream had mercury readings 30 times higher than what the U.S. Environmental Protection Agency recommends for fresh water containing fish that humans consume. Worse, detectable levels of the more lethal methylmercury were found in three local lakes by a group of scientists from India’s Department of Atomic Energy and Jawaharlal Nehru Technological University, Hyderabad. 29 Their findings, which were published in the journal Environmental Pollution in 2006, showed that half of all mercury levels detected in fish was methylmercury. In Japan no detectable levels of methylmercury are acceptable at all, Dr Tanaka confirmed. 30 Responding to our questions, Hindustan Unilever points to its own consultant’s studies showing mercury concentrations in the stream and lake are low overall. Today Hindustan Unilever has persuaded the Tamil Nadu Pollution Control Board (TNPCB) that its responsibilities are limited to cleaning the factory site and no further. It also maintains that it need only clean those areas where soil concentrations are higher than 25 milligrams a kg, based on the land being used for residential housing in the future. 31 That is 25 times the level acceptable in Britain, according to the U.K. Environment Agency soil guideline values. 32 And 2.5 times the level acceptable in the Netherlands, according to its own consultant. 33 This does not even address the question of what levels might be necessary to protect a rare forest. Hindustan Unilever failed to acknowledge this policy in response to our questions and maintained it was conducting soil cleaning as approved by the TNPCB. It maintained that the “intervention” standards set in Britain and the Netherlands are different from clean-up standards. It claimed that the Dutch intervention value was raised in 2006 to 36 milligrams a kg and pointed to the lack of standards in India. 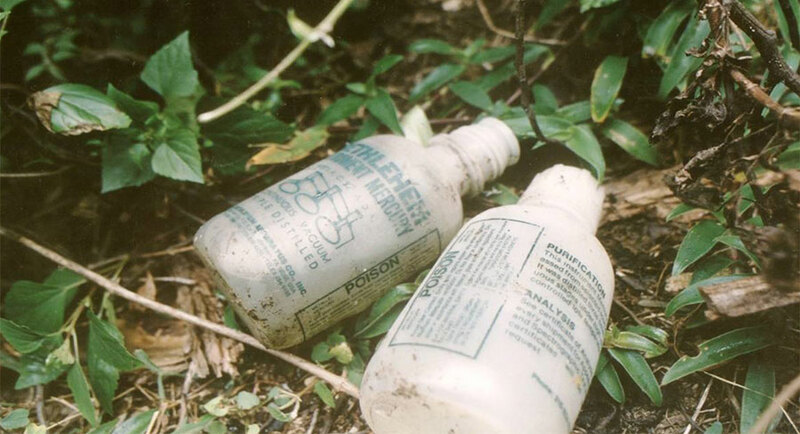 BOTTLES that contained raw mercury dumped in the undergrowth outside the boundary wall at the back of the factory disregarding procedures laid down for the disposal of hazardous waste. Residents and workers say standards in the Kodaikanal factory began to deteriorate from 1987, when managerial staff brought by Ponds from the U.S. left India following Unilever’s acquisition. 38 Ironically for Hindustan Unilever and its parent company, new laws were adopted in India around the same time in the wake of the Bhopal gas calamity of December 2-3, 1984: the Environment (Protection) Act 1986, hazardous process amendments to the Factories Act 1987, and Hazardous Waste Rules 1989. Did the factory comply with the new legal requirements? Material examined in this investigation confirms some of their allegations. In the appointment letters, training evaluation and standing orders placed before the Madras High Court by Hindustan Unilever, none mentions the dangers of mercury or the precautions necessary. 40 Recent disclosures of equipment obtained under the Right to Information Act from the Commissioner of Central Excise, Tamil Nadu, show that special filter masks were neither imported nor bought from the domestic market. 41 According to former workers, even the coveralls and soft cloth gloves that were provided were often removed – it was hot and they were keen to prevent the thermometers slipping out of their hands so as to meet the production target of 75,000 thermometers a day. 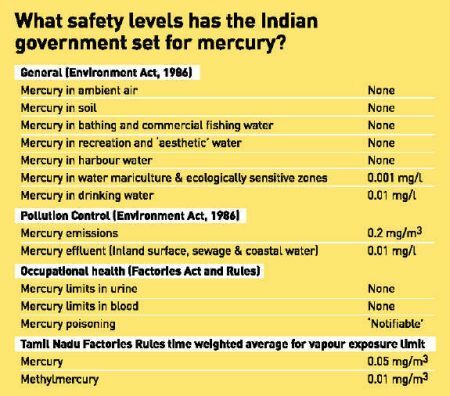 Spot assessments of mercury levels seen by the Indian People’s Tribunal on Environment and Health in 2002 show vapour levels were recorded at over four times the level at which mercury affects the central nervous system (0.1 milligram per cubic metre). 46This is almost 10 times the 0.05 milligram per cubic metre for a 40-hour working week required by the Tamil Nadu government. That does not account for the overtime that workers say they regularly put in. In 1992, the total year average exceeded 0.05 mg/m3, according to Hindustan Unilever’s own consultant’s report. 47 The company told Frontline that the factory followed laid-down procedures when mercury levels in air were exceeded. Post-shutdown, Hindustan Unilever has avoided independent assessment. Instead, it has relied on questionable scientific studies it commissioned or conducted itself. S.A. MAHINDRAN, president of the Ex-Mercury Employees Welfare Association. “The soil is polluted, the walls are polluted, but the people who work there are not polluted how?” he asks. This risk assessment study failed to undertake important hydrological studies determining movement of pollutants through groundwater, which may move in a different direction from surface water. 61 In a place like Kodaikanal, which sits on a rock massif, this would be important. According to Dr Tanaka, soil sampling has a specific technique based on a grid system: at each point samples should be taken from the surface and at a 50 cm depth, mixed, divided, and then weighed. 62 There is no evidence that such assessment took place. 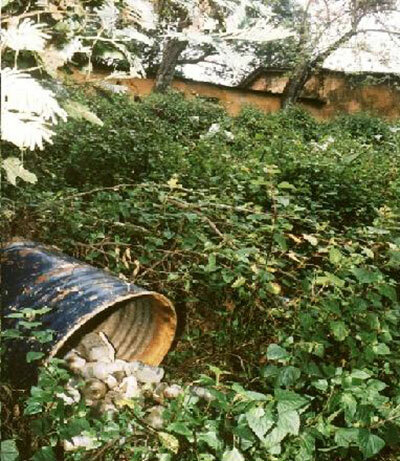 The Indian People’s Tribunal notes that offsite sampling in this case was patchy, unorganised, and “insufficient to indicate that the report presents a proper environmental assessment.” 63 Methylmercury assessments were made from surface samples, but bottom samples would have been more appropriate, according to specifications suggested by the Japanese Public Health Association’s 2001 report. 64 No account has been given of why particular samples on and offsite were singled out for methylmercury testing. Just as it did with the environment study, Hindustan Unilever avoided independent investigation of workers’ health. After the factory was closed, its medical and occupational health vice president, Dr T. Rajagopal, undertook a study of around 250 employees and ex-employees, found that they had a considerable number of health symptoms, and dismissed these. That study was published in the Indian Journal of Occupational Health and Environmental Medicine, of which Dr Rajagopal is on the editorial advisory board. 66Shockingly, the article appeared without declaration of conflict of interest. Nor was the fact that the population in question was drawn from the company’s own workforce disclosed. In this manner, the company gave the workers and itself a clean bill of health. 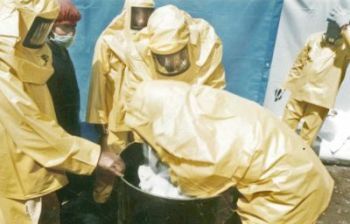 DECONTAMINATION WORKERS WITH minimum protective gear at the contaminated factory site in March 2010. The court eventually ordered that an expert committee of doctors should visit Kodaikanal to find out whether the workers’ health problems were “relatable to mercury exposure”. The answer that came back – “not specific only to mercury exposure” – was not to the question asked. 69 Not one of the doctors was a neurologist, who according to the Japanese Public Health Association is the only specialist qualified to assess symptoms of brain damage. 70 The team was headed by Dr A.K. Srivastava – the same doctor from the ITRC who had already submitted his opinion supporting Hindustan Unilever’s case. It has also charged the company in court with not being truthful in its submissions to the expert committee. Information collected by workers reveals that medical records denied to them were supplied to the committee for certain workers, particularly for women. Eighteen of them hold letters from the company informing them that their medical records do not exist. 75 Hindustan Unilever’s explanation to Frontline is that women’s readings on record are averages based around the group mean. Crucially, 306 workers were denied access to their own medical health records. 76 This is significant not just because workers have been denied what is their right, but also because Hindustan Unilever has relied on these data to defend itself. Reports viewed by us from the company, the doctors who reviewed their study, and the court-appointed expert committee all state that workers’ symptoms did not match up with test results in their medical records showing ‘safe’ levels of mercury in urine. Therefore, they surmise, their symptoms must be attributable to some other problem. 77 They also maintain that because mercury passes through the body quickly, it is now too late to know for sure if workers are poisoned. But these assumptions display just how little expertise has been brought to bear on the issue. Hindustan Unilever, and Ponds before it, took advantage of the insensitivity of the law and the lack of critical examination by regulators. The regulators failed to do their duty even under the prevalent law. The factory was given permission to set up in Kodaikanal on shaky grounds to begin with. The Ponds India management got special permission from the Central government to set up on the grounds that it was a non-polluting glass manufacturing unit. 85 No formal site selection or screening process was undertaken to assess and minimise the impact of a mercury thermometer plant in an eco-sensitive area. The Tamil Nadu government authorities were hardly sensitive to the hazards present in the thermometer manufacturing process. The Tamil Nadu Factories Inspectorate kept minimal data on the company’s operations, as records produced before the court reveal. 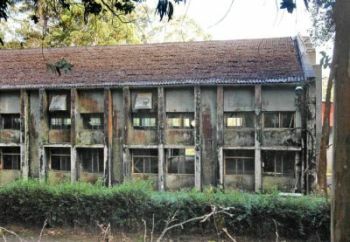 89In 1995, the Chief Inspector of Factories noted new buildings had been built without sanction, but this was only spotted because the company applied to the inspectorate to remove them. 90 In 1998, Dr W.R.S. Thangasamy, Certifying Surgeon of the Factories Inspectorate, visited the factory. He concluded that “no workers were found to be working in direct contact with mercury and there is no chance for mercury poisoning,” without mentioning medical tests or reports. 91 After the factory closed, the Deputy Inspector of Factories, Sivakasi, examined 75 workers, their medical histories, and any past test reports in seven hours (excluding lunch). 92 That is a rate of one worker every five minutes. THE SCRAPYARD AT Moonjikkal in Kodaikanal where the mercury-containing waste from the factory was dumped. PHOTO : G.KARTHIKEYAN. Nor did the Pollution Control Board fare much better. Records of a visit to the Kodaikanal factory in March 1999 show random air-monitoring samples were taken but not from all emission points. No sample was taken for mercury. In June 1999, a sample was taken to test for mercury and has been filed by the company before the Madras High Court to show the environment was safe for workers. 93 Significantly, no contemporaneous records of methylmercury sampling, effluent sampling, water sampling, soil sampling, onsite hazardous waste disposal procedures, exposure pathways, or safety contingency plans while the factory was in operation have been produced by the company before the High Court. Instead, the TNPCB allowed Hindustan Unilever to contract Environmental Resource Management (ERM) and the National Environmental Engineering Research Institute (NEERI) to make secondary assessments of decontamination targets and techniques. This meant that a member of the Supreme Court Monitoring Committee, Dr Tapan Chakrabarti, 95 head of NEERI’s Biotech division, was now drawn into this contracted exercise. THE TNPCB’S LETTER to Hindustan Unilever granting permission for cleaning up the soil on the factory site to standards agreed by the TNPCB. In a letter to the Union Ministry of Environment and Forests in March 2010, the TNPCB said that standards had not been finalised. The objection of two Tamil Nadu-based members of the monitoring committee, Dr D.B. Boralkar and Dr Claude Alvares, that the Supreme Court’s directions had “not been carried out in letter or in spirit,” 97 was not enough to change things. Right to Information Act requests reveal that Dr Boralkar and Dr Alvares were dropped from future meetings and that, instead of involving local residents, a ‘scientific experts’ committee was set up. 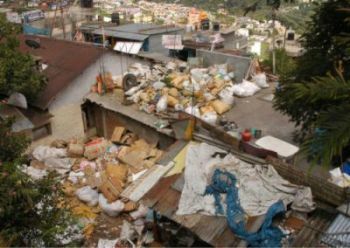 In June 2008, the clean-up standards for the factory were suddenly downgraded and the go-ahead was given for decontamination without informing the local community, the local forest department, or the municipal administration. 98 The TNPCB, Hindustan Unilever, and its paid consultants had been meeting behind closed doors from 2005 onwards. 99 The new standard allowed over twice the level of mercury suggested by Dames and Moore of the Dutch standard of 10mg/kg. No scientific justification for the change in clean-up target levels has been given. Now, the TNPCB has claimed to the Government of India’s Ministry of Environment and Forests that the standards were never finalised, information obtained under the Right to Information Act reveals. 100 But Frontline has a copy of the letter from the TNPCB giving approval to Hindustan Unilever to remediate to the standards discussed, allowing the polluter a free hand on its own site. Responding to our written questions, the company admits breach of established procedure in the sale of mercury-contaminated glass to a local scrap dealer. It also admits to polluting the soil on its Kodaikanal factory grounds with 366 kg of mercury. It admits to engaging, paying for, and conducting key scientific assessments itself but denies these are questionable. It maintains that the journal article published by its own doctors was peer-reviewed and hence there was no need for declaration of conflict of interest. The company maintains it has shared medical records with the employees, but admits only those from high-risk areas. It admits it has relied on year averages for women. It denies that the factory was a hazardous operation under law or that it compromised on safety and endangered workers’ health. It points to records of monitoring undertaken at the factory, periodic evaluations of regulators, and the conclusions of the expert committee of doctors as evidence that it has no further obligations towards its employees for polluting the environment or for their health problems. 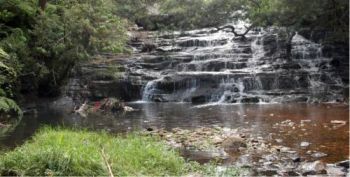 THE PAMBAR STREAM in Kodaikanal. 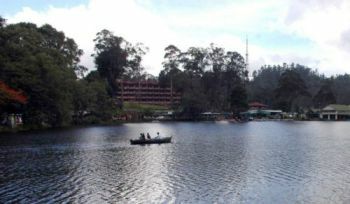 A U.S.-based scientist who reviewed test results at the request of the workers noted that surface water samples from parts of the stream and the Kodai lake had mercury readings 30 times higher than what the U.S. Environmental Protection Agency recommends for fresh water containing fish that people consume. Hindustan Unilever maintains that it is within safe levels. PHOTO : G.KARTHIKEYAN. 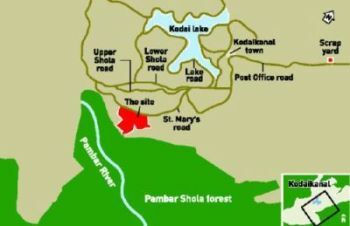 It denies polluting the forest and lakes beyond its boundary walls, and maintains that its only remaining obligation to the wider community in Kodaikanal is to clean the soil to a standard its own consultants set. It denies that the pollution control board has already agreed to this standard. A VIEW OF the Kodai lake. Scientists from the DAE and the JNTU, Hyderabad, found detectable levels of methylmercury in this and two other lakes. The company says the mercury concentrations are low overall. 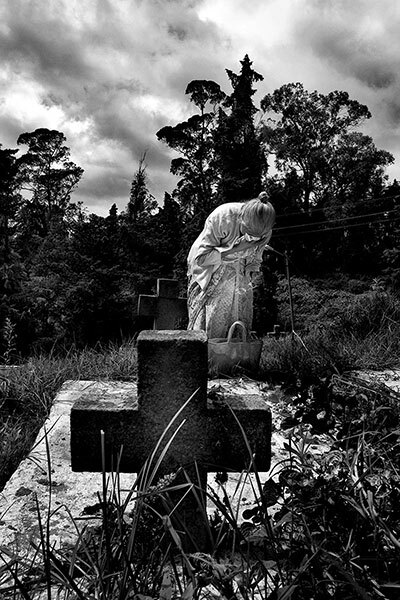 PHOTO : G.KARTHIKEYAN. 1. 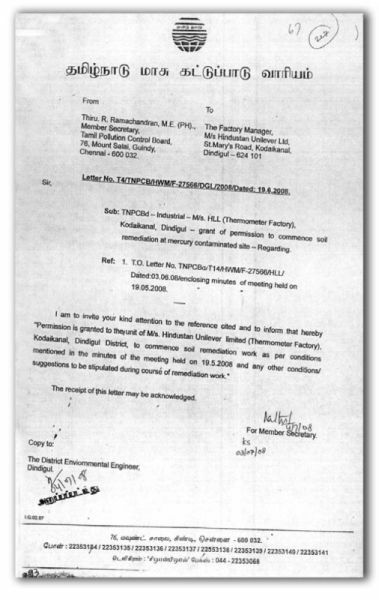 National Environmental Engineering Research Institute (February 2007): “Protocol for Remediation of Mercury Contaminated Site at HLL Thermometer Factory, Kodaikanal”. 2. “Dump for a dump, from India to U.S.”, The Statesman, April 17, 2003; “HLL Mercury Waste to leave for NY on May 7”, Business Line, May 5, 2003; “Activists hail reverse dumping”, International Herald Tribune, May 9, 2003; “HUL in a spot over NGO report”, India Business Insight, June 12, 2003; “Thermometer plant acted responsibly, says Banga”, Business Line, June 14, 2003; “Mercury’s victims”, Frontline, August 16, 2003. 3. Interview with R. Vijaylakshmi, former temporary worker at Kodaikanal Mercury Thermometer Factory, March 15, 2010, Kodaikanal. 4. Affidavit of M.A. Mahindran, president, Ponds/HLL Ex-Mercury Employees Welfare Association, April 19, 2006, paragraph 33. 5. Interviews with former employees, Kodaikanal Mercury Thermometer Factory, March 12-17, 2010, Kodaikanal. 6. Details from PowerPoint presentation made during interview with Dr T. Rajgopal, vice president, medical and occupational health, Hindustan Unilever: “Kodai thermometer factory – occupational health surveillance,” March 23, 2010, Chennai. 7. Telephone interview with Dr Linda M. Jones, Senior Lecturer, School of Psychology, Massey University, New Zealand, July 26, 2010. 8. Affidavit of S. Raja Mohamed, general secretary, Ponds/HLL Ex-Mercury Employees Welfare Association, Objections to the [Experts’] Committee Report, June 30, 2008: “Chart on urine levels of women employees”: 47-53. 9. United States Agency for Toxic Substances and Disease Registry (March 1999): Toxicological Profile for Mercury: 13 and 58. 10. T. Rajgopal et al (April 2006): “Epidemiological surveillance of employees in a mercury thermometer plant”, Indian Journal of Occupational and Environmental Health, Volume 10. 11. Interview with Dr T. Rajgopal, vice president, medical and occupational health, Hindustan Unilever, March 23, 2010, Chennai. 12. Affidavit of M.A. Mahindran, president, Ponds/HLL Ex-Mercury Employees Welfare Association, February 19, 2006. 13. Interview with Dr T. Rajgopal, vice president, medical and occupational health, Hindustan Unilever, March 23, 2010, Chennai. 14. Interview with Rajesh Mani, Greenearth Trust, March 12, 2010, Kodaikanal. 15. URS Dames and Moore (May 8, 2002): “Environmental Site Assessment and Risk Assessment for Mercury HLL Thermometer Factory Site, Kodaikanal, Tamil Nadu, India”: 2-1. 16. Letter from Assistant Commissioner, Central Excise, Dindigul (C.No.IV/16/28/2002), dated April 29, 2003, to M/s Hindustan Lever Ltd: “Permission to export mercury-containing waste”. 17. Email from R. Ram, Corporate Communications, Hindustan Unilever, August 20, 2010. 18. URS Dames and Moore (May 8, 2002): “Environmental Site Assessment and Risk Assessment for Mercury HLL Thermometer Factory Site, Kodaikanal, Tamil Nadu, India”, Table 9: “Onsite Mercury Distribution and Details of Remediation Areas”. 20. Presentation at Alliance Francaise by Shekar Dattatri, documentary film-maker, March 17, 2010, Chennai. 21. URS Dames and Moore (May 8, 2002): “Environmental Site Assessment and Risk Assessment for Mercury HLL Thermometer Factory Site, Kodaikanal, Tamil Nadu, India”: 4-3. 22. Details from PowerPoint presentation made during interview with K. Gopalakrishnan, former stores-in-charge, Kodaikanal Mercury Thermometer Factory: “Mercury Balance: Account of the lost mercury in Kodaikanal”, March 13, 2010, Kodaikanal. 23. URS Dames and Moore (May 8, 2002): “Environmental Site Assessment and Risk Assessment for Mercury HLL Thermometer Factory Site, Kodaikanal, Tamil Nadu, India”, Table 9: “Onsite Mercury Distribution and Details of Remediation Areas”. 24. Japan Public Health Association (October 2001): “Preventive Measures against Environmental Mercury Pollution and Its Health Effects”: 28. 25. URS Dames and Moore (May 8, 2002): “Environmental Site Assessment and Risk Assessment for Mercury HLL Thermometer Factory Site, Kodaikanal, Tamil Nadu, India”: 5-4. 26. Email from Dr Masaru Tanaka, Lead, United Nations Environment Programme Global Mercury Partnership Waste Management Area, and Chairperson, Waste Management and Recycling Experts’ Committee, Central Environment Council, Ministry of Environment, Government of Japan, August 16, 2010. 27. URS Dames and Moore (May 8, 2002): “Environmental Site Assessment and Risk Assessment for Mercury HLL Thermometer Factory Site, Kodaikanal, Tamil Nadu, India”: Tables 7 and 8. 28. Memo from Dr Mark Chernaik, Environmental Law Alliance, “Critical assessment of documents purporting to support a site-specific target level of 25 mg/kg for the remediation of mercury-contaminated soils at the HUL factory site in Kodaikanal”, March 5, 2010. 29. D. Karunasagar et al (2006): “Studies of mercury pollution in a lake due to a thermometer factory situated in a tourist resort: Kodaikanal, India”, Environmental Pollution (143): 153-158. 30. Email from Dr Masaru Tanaka, Lead, United Nations Environment Programme Global Mercury Partnership Waste Management Area, and Chairperson, Waste Management and Recycling Experts’ Committee, Central Environment Council, Ministry of Environment, Government of Japan, August 16, 2010. 31. Interview with John George, factory manager, Kodaikanal, Hindustan Unilever, March 23, 2010, Chennai. 32. U.K. Environment Agency (March 2009): “Soil Guidelines Values for Mercury in Soil”. 33. URS Dames and Moore (May 8, 2002): “Environmental Site Assessment and Risk Assessment for Mercury HLL Thermometer Factory Site, Kodaikanal, Tamil Nadu, India”: 5-1. 34. Unilever Environment Policy PDF from website. 37. India Water Pollution Act (1974). 38. Interview with Girija Viraraghavan and others from the Palani Hills Conservation Council, March 12, 2010, Kodaikanal, and affidavit of M.A. Mahindran, president, Ponds/HLL Ex-Mercury Employees Welfare Association, February 19, 2006. 39. Affidavit of M.A. Mahindran, president, Ponds/HLL Ex-Mercury Employees Welfare Association, February 19, 2006 and April 19, 2006. 40. Counter affidavit of M.K. Sharma, vice chairman, Hindustan Unilever, April 12, 2006: Annex 16. 41. “Statement showing capital goods imported without duty”, Office of the Assistant Commissioner of Central Excise, Dindigul, obtained through Right to Information Act request, September 24, 2008 and appeal, March 1, 2009, by Shweta Narayan. 42. Environmental Resource Management (October 2006): “Site specific target levels”. 43. Affidavit of M.A. Mahindran, president, Ponds/HLL Ex-Mercury Employees Welfare Association, April 19, 2006, paragraph 31; Affidavit of M.A. Mahindran, president, Ponds/HLL Ex-Mercury Employees Welfare Association, November 4, 2006; Ex-Mercury Employees Welfare Association, Objections to the [Experts’] Committee report, June 30, 2008: “Comparison of urine levels (mean values) submitted by the company to the Committee: Hazardous and Non Hazardous Areas”: 54-56. 44. Affidavit of S. Raja Mohamed, general secretary, Ponds/HLL Ex-Mercury Employees Welfare Association, June 30, 2008: 17. 45. Affidavit of M.A. Mahindran, president, Ponds/HLL Ex-Mercury Employees Welfare Association, January 31, 2007. 46. Justice S.N. Bhargava, Retired Chief Justice, Sikkim High Court, and State Human Rights Commission Chairperson, Manipur, et al (June 2003): “Indian People’s Tribunal Report on the alleged Environmental Pollution and Health Impacts Caused by the Hindustan Lever Thermometer Factory at Kodaikanal”: 34. 47. URS Dames and Moore (May 8, 2002): “Environmental Site Assessment and Risk Assessment for Mercury HLL Thermometer Factory Site, Kodaikanal, Tamil Nadu, India”: Table 3 Air Monitoring Data. 48. Counter affidavit of M.K. Sharma, vice chairman, Hindustan Unilever, April 12, 2006: “Register of Accidents and Register of Dangerous Occurrences”: Annex 19. 49. Affidavit of K. Gopalakrishnan, August 18, 2006. 50. URS Dames and Moore (May 8, 2002): “Environmental Site Assessment and Risk Assessment for Mercury HLL Thermometer Factory Site, Kodaikanal, Tamil Nadu, India”: 2-3. 51. URS Dames and Moore (May 8, 2002): “Environmental Site Assessment and Risk Assessment for Mercury HLL Thermometer Factory Site, Kodaikanal, Tamil Nadu, India”: 2-3. 52. Interview with Girija Viraraghavan and others from the Palani Hills Conservation Council, March 12, 2010, Kodaikanal. 53. URS Dames and Moore (May 8, 2002): “Environmental Site Assessment and Risk Assessment for Mercury HLL Thermometer Factory Site, Kodaikanal, Tamil Nadu, India”: 2-3. 54. Counter affidavit of M.K. Sharma, vice president, Hindustan Unilever, April 12, 2006: “Permission to collect and store hazardous waste from TNPCB, August 9, 1994”: Annex 12. 55. Letter from Assistant Commissioner, Central Excise, Dindigul (C.NO.4/16/28/2002), dated April 29, 2003, to M/s Hindustan Lever Ltd: “Permission to export mercury-containing waste”. 56. URS Dames and Moore (May 8, 2002): “Environmental Site Assessment and Risk Assessment for Mercury HLL Thermometer Factory Site, Kodaikanal, Tamil Nadu, India”: 1-1. 57. URS Dames and Moore (May 8, 2002): “Environmental Site Assessment and Risk Assessment for Mercury HLL Thermometer Factory Site, Kodaikanal, Tamil Nadu, India”: Tables 5, 6, 7, 8 and 10. 58. URS Dames and Moore (May 8, 2002): “Environmental Site Assessment and Risk Assessment for Mercury HLL Thermometer Factory Site, Kodaikanal, Tamil Nadu, India”: 1-1. 59. URS Dames and Moore (May 8, 2002): “Environmental Site Assessment and Risk Assessment for Mercury HLL Thermometer Factory Site, Kodaikanal, Tamil Nadu, India”: 1-2. 60. URS Dames and Moore (8 May 2002): “Environmental Site Assessment and Risk Assessment for Mercury HLL Thermometer Factory Site, Kodaikanal, Tamil Nadu, India”: Table 5. 61. Background source conversation, July 2010. 62. Email from Dr Masaru Tanaka, Lead, United Nations Environment Programme Global Mercury Partnership Waste Management Area, and Chairperson, Waste Management and Recycling Experts Committee, Central Environment Council, Ministry of Environment, Government of Japan, August 16, 2010. 63. Justice S.N. Bhargava, Retired Chief Justice, Sikkim High Court, and State Human Rights Commission Chairperson, Manipur, et al (June 2003): “Indian People’s Tribunal Report on the alleged Environmental Pollution and Health Impacts Caused by the Hindustan Lever Thermometer Factory at Kodaikanal”: 30. 64. Justice S.N. Bhargava, Retired Chief Justice, Sikkim High Court, and State Human Rights Commission Chairperson, Manipur, et al (June 2003): “Indian People’s Tribunal Report on the alleged Environmental Pollution and Health Impacts Caused by the Hindustan Lever Thermometer Factory at Kodaikanal”: 32; and Japan Public Health Association (October 2001): “Preventive Measures against Environmental Mercury Pollution and Its Health Effects”: 28. 65. Interview with M.A. 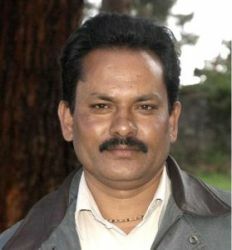 Mahindran, president, Ponds/HLL Ex-Mercury Employees Welfare Association, March 12, 2010, Kodaikanal. 66. Indian Journal of Occupational and Environmental Medicine, Volume 11, Issue 3, December 2007. 67. Report of the Indian Toxicological Research Centre: “Review of health records/exposure data”; Letter of Dr H.N. Saiyed, National Institute of Occupational and Social Health, September 11, 2006; Letter of Dr C.S. Pandav and Dr R.M. Pandey, All-India Institute of Medical Sciences, October 3, 2006. 68. Affidavit of S. Raja Mohamed, general secretary, Ponds/HLL Ex-Mercury Employees Welfare Association, June 30, 2008: 12. 69. Affidavit of S. Raja Mohamed, general secretary, Ponds/HLL Ex-Mercury Employees Welfare Association, June 30, 2008: 1. 70. Japan Public Health Association (October 2001): “Preventive Measures against Environmental Mercury Pollution and its Health Effects”: 56. 71. Telephone interview with Dr Linda M. Jones, Senior Lecturer, School of Psychology, Massey University, New Zealand, July 26, 2010. 72. Interview with Dr Jayaprakash Muliyil, Principal, Christian Medical College, Vellore, July 24, 2010, Vellore. 73. Interview with Dr Jayaprakash Muliyil, Principal, Christian Medical College, Vellore, July 24, 2010, Vellore. 74. Affidavit of S. Raja Mohamed, June 30, 2008. 75. Calculated from records held by the Ponds/HLL Ex-Mercury Employees Welfare Association. 77. T. Rajgopal et al (April 2006): “Epidemiological surveillance of employees in a mercury thermometer plant”, Indian Journal of Occupational and Environmental Health, Volume 10; Report of the Indian Toxicological Research Centre: “Review of health records/exposure data”; Letter of Dr. H.N. Saiyed, National Institute of Occupational and Social Health, September 11, 2006; Letter of Dr C.S. Pandav and Dr R.M. Pandey, All-India Institute of Medical Sciences, October 3, 2006; and Report of the Committee of Experts, December 24, 2007. 78. Telephone interview with Dr Linda M. Jones, Senior Lecturer, School of Psychology, Massey University, New Zealand, July 26, 2010. 79. Telephone interview with Dr Linda M. Jones, Senior Lecturer, School of Psychology, Massey University, New Zealand, July 26, 2010. 80. Telephone interview with Dr Linda M. Jones, Senior Lecturer, School of Psychology, Massey University, New Zealand, July 26, 2010. 81. Affidavit of S. Raja Mohamed, general secretary, Ponds/HLL Ex-Mercury Employees Welfare Association, Objections to the [Experts’] Committee report, June 30, 2008: “Details of the 13 ex-workers examined by the committee”: 57-59. 82. Telephone interview with Dr Linda M. Jones, Senior Lecturer, School of Psychology, Massey University, New Zealand, July 26, 2010. 83. Telephone interview with Dr Linda M. Jones, Senior Lecturer, School of Psychology, Massey University, New Zealand, July 26, 2010. 84. Telephone interview with Dr Linda M. Jones, Senior Lecturer, School of Psychology, Massey University, New Zealand, July 26, 2010. 85. Counter affidavit of M.K. Sharma, vice chairman, Hindustan Unilever, April 12, 2006: “Form 100% Export Oriented Unit Application for licence or permission for establishment” to Department of Industry, Central Government, New Delhi, in the name of Pond’s Exports Ltd and “Approval”, September 4, 1982: Annex 11. 86. From the records of the Tamil Nadu Factories Inspectorate produced before the court following the order of the Madras High Court on March 27, 2006: 3. 87. From the records of the Tamil Nadu Factories Inspectorate produced before the court following the order of the Madras High Court on March 27, 2006: 4. 88. Respondent affidavit of M.K. Sharma, vice chairman, Hindustan Unilever, October 11, 2006: Annex 3. 89. From the records of the Tamil Nadu Factories Inspectorate produced before the court following the order of the Madras High Court on March 27, 2006. 90. From the records of the Tamil Nadu Factories Inspectorate produced before the court following the order of the Madras High Court on March 27, 2006: 2. 91. Counter affidavit of M.K. Sharma, vice chairman, Hindustan Unilever, April 12, 2006: “Health Survey” by Dr W.R.S. Thangasamy, Certifying Surgeon of the Factories Inspectorate, July 16, 1998: Annex 20. 92. Affidavit of M.A. Mahindran, president, Ponds/HLL Ex-Mercury Employees Welfare Association, February 19, 2006: paragraph 29. 93. Counter affidavit of M.K. Sharma, vice chairman, Hindustan Unilever, April 12, 2006: “TNPCB Ambient Air Quality Survey”, March 22, 1999, and “TNPCB Advance Environmental Laboratory, Madurai Results” collected June 23, 1999: Annex 19. 94. Supreme Court Monitoring Committee (September 2004): “Report of the visit of the SCMC to Tamil Nadu”. 95. Supreme Court Monitoring Committee (September 2004): “Report of the visit of the SCMC to Tamil Nadu”: 1. 96. Last recorded meeting, May 3, 2005, from minutes obtained under Right to Information Act request dated January 13, 2010, by Shweta Narayan, and granted February (undated) 2010. 97. Letter to R. Ramachandran, TNPCB, from Dr Claude Alvares, August 16, 2005, obtained under Right to Information Act request dated January 13, 2010, by Shweta Narayan, and granted February (undated) 2010. 98. Letter T4/TNPCB/HWM/F-27566/DGL/2008 from R. Ramachandran, TNPCB, to factory manager, Hindustan Unilever, June 19, 2008. 99. Minutes of meeting, April, June, December 2007, obtained under Right to Information Act request dated January 13, 2010, by Shweta Narayan, and granted February (undated) 2010. 100. TNPCB status note to Ministry of Environment and Forests, New Delhi, March 2010, and information obtained under Right to Information Act request dated March 30, 2010, by Shweta Narayan, and granted April 1, 2010. 101. Hindustan Unilever Annual Report 2009-2010. 102. Email from Dr Masaru Tanaka, Lead, United Nations Environment Programme Global Mercury Partnership Waste Management Area, and Chairperson, Waste Management and Recycling Experts Committee, Central Environment Council, Ministry of Environment, Government of Japan, August 16, 2010. ← Is your garam masala safe from mercury?